So that you know where I’m coming from, I’m a big fan of The Puppet Masters (the Heinlein book, not so much the movie) and Invasion of the Body Snatchers, (the original movie and the Donald Sutherland remake, not so much the book, but only because I never read it). I’m just wired to like “quiet invasion” stories, which might explain my lifelong affinity for They Live. There’s something intrinsically spooky about the thought of having your identity stolen… or finding out the person you know better than anyone else is no longer said person. 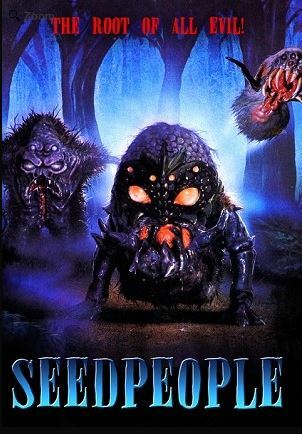 Seedpeople, a movie I’ve kind of wanted to see ever since I saw the full-page ad in the back of a Fangoria, says in the opening credits: Original Idea by Charles Band. Well, I’m not sure about “original,” but if you’re expecting anything other than a throwback to 50s monster movies with a hint of science fiction, you’ll probably be disappointed. You might be disappointed anyway. Movies like this are only as good as their mad scientist. 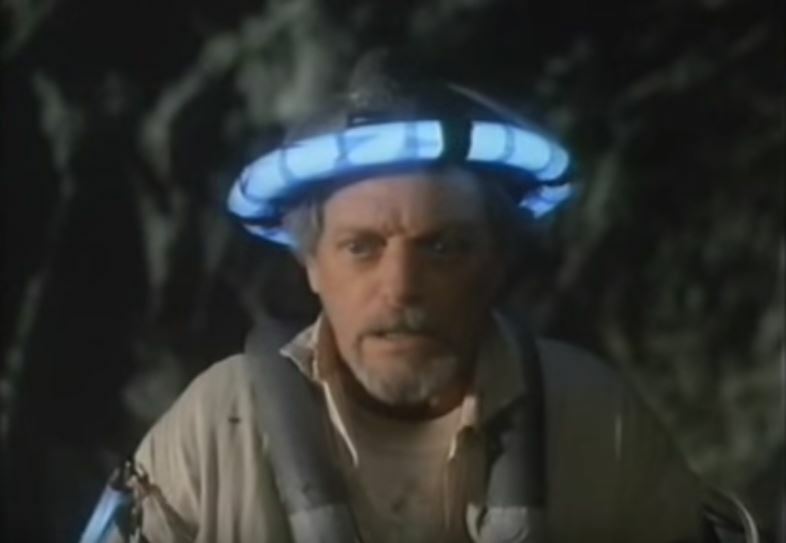 This one was primed to be great—he’s a kooky old drunk with UV lights strapped to his head and arms—but he’s relegated to explaining the plot, which really isn’t complicated enough to warrant as much dialogue as they give it. Before we go any further, I just want to point out the greatest thing Seedpeople has to offer is the following line, spoken by a none-too bright farmer who’s just stumbled upon an alien spore: “What in the ding-dong-heck-a-ma-doodle is that?” Yes, that may be the dumbest line in a movie ever. And I love it. The film is set in a remote town called Comet Valley and, conveniently, there’s a single bridge which leads in and out of the community. Even more convenient: it’s about to be closed for maintenance for three days. The main character arrives just before they close it down. He’s a geologist (or something like that) who’s still in love with his ex-girlfriend who now runs a bed and breakfast. She’s also dating the town sheriff, who hates the main character in a junior high drama kind of way. Which is to say nothing about the main character’s childish advances on his old flame. He pursues her with a persistence that’s downright creepy and laughable. He’s a forty-something acting like a lovesick teenager. All of this is explained in a flashback because, after the events that took place in Comet Valley, the hero is being interrogated by the government. Yes, it’s another flashback movie. No, it’s not any better than most of them. Yes, they’ll go for the twist ending you’re already expecting. The movie’s so predictable, as soon as the lead female and the teenager become seedpeople, you’ll know there’s going to be a peaceful solution to the problem. No, I’m not giving everything away, but the remaining tricks up its sleeve are nothing special. I’ve said before I’m a fan of Full Moon movies, but I just can’t recommend this one. Although there’s certainly plenty of cheese to enjoy, the movie itself is goddamned routine. But that’s the great thing about horror movies: the bad ones remind you to cherish the rare ones. I’ve been picking so many winners this month, it was nice to have the opportunity to reset.